Nuby sent us some products from the forever growing range of weaning & feeding products. We’ve not tried Nuby before so jumped at the chance to try out this funky coloured feeding equipment. The nibbler is the perfect item for any weaning baby; you can put anything from fruit & veggies to frozen stuff (great idea for a teething baby!) into the net. It has a squeeze & lock system which prevents the child from opening it. Replacement Nibbler nets are available if you need them. As well as yellow/orange it also comes in pink/purple and blue/green. 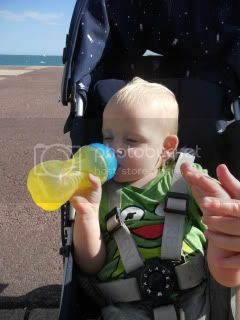 I wanted one of these when Oli was at the weaning/younger stage, but I just couldn’t find anywhere that sold them. My excitement at finding out that Nuby sold them was enough to make me want another one. I’m pretty sure he has gone past the stage of a nibbler being much use to him now he knows how to hold things , I would have used it as a teether ( we went through a lot of frozen banana which got very messy! ) but he are nearly all through so we brought it to a friends house where we’ve been staying all week. Meet Mr A , seven months and belongs to Glowstars. The perfect example of how the nibbler can be of great use. 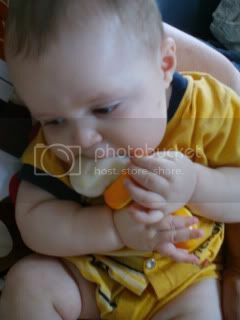 Mr A only started weaning recently, and his parents have chosen to go down the BLW route. We squashed some banana into the net and attached it to the handle and then passed it to Mr A, he got on perfectly fine with it. The banana easily came out at the right speed and the right amount. The only mess that was made was from holding the net part, but he’ll soon learn to use the grip. £3.99 is a fantastic price for this genius product that will save you time and mess! Something else we got Mr A to try out for us. The silicone squeeze feeder is from Nuby’s Natural touch range. The feeder is just as genius as the nibbler. You simply pure the food into the squeezer end, pop the spoon part back on and then to control the amount of food that comes on to the spoon just give the squeezer bit a squeeze! It’s ideal to use when you’re out and about as there’s no fussing around with spoons (or forgotten spoons in my case!) and there’s a slip on cover for the spoon part, so no searching around for baby wipes to wipe it. 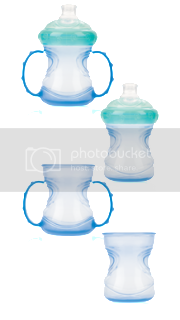 The convert-a-cup has four different stages which will see you from the first cup to an open cup without any handles or spout. 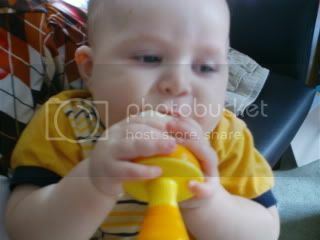 The spout has touch flow technology which activates as soon as the child puts the silicone spout in his or hers mouth. It’s easy to transform into each different stage as well as easy to clean. It has a one piece no spill spout & lid which means no messing around with fiddly parts. The handle is clever enough to support through all stages and can even be taken off to allow it to be a freestanding upright normal cup. It contains 8oz. Oli used it as a cup with handles but give it some time, and I’m sure those handles and spout will soon be off. This is the perfect straw training beaker, I’ve been trying to get Oli used to straws over the last few months but have not had much success, so I wasn’t sure how this would work with him. I was surprised to see him get to grip with it quickly & easily. 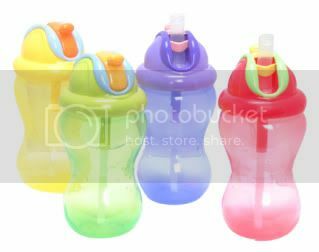 Along with many of the other Nuby products, the super sipper flexi straw comes in a variety of colours. One for the older children (suitable for 18mths+) I did get it out of the packet and did try to introduce it to Oli, but he was more interested in his flexi straw. So have put it aside ready for a couple of months time when he’s ready to have another go at trying it. Good value at £3.99! I am totally impressed with the quality of Nuby products, They have everything you need to see you through the first few years of your child’s life.